Hi there. Hey I just picked an 04 Scion xB Release Series 1.0, 94kmiles original owner, stock. It has pretty cool orange and black leather seats front and back. The front says "Special Edition". Were these an additional option to this model? I can't find anything out there regarding these seats. Thanks. Last edited by MR_LUV; 03-06-2019 at 12:33 AM. You have a RS1 -Hot Lava Edition. But, you have Aftermarket Seats. 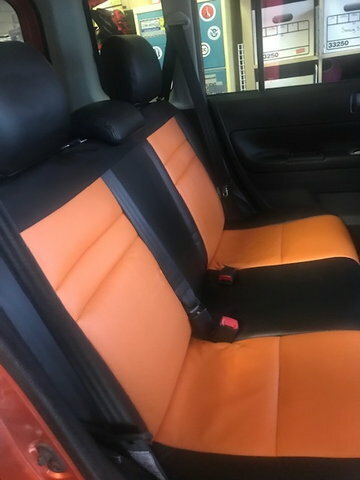 Your Orange and Black Leather Seats someone Added later on. They are Not part of the Original RS1 Package. 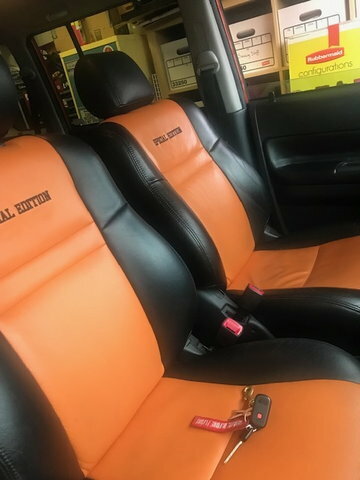 They're original seats with aftermarket leather on them. and it looks like your headrests might be on backwards. How about that?!! Good eye....I guess I'll keep em. thanks all. Anyone change the front seats out? Lexus seats maybe? VIP? Quick Reply: New to me 2004 xB Release Series 1.0 and Seats? !